Mark the special places you've visited together with Wendy Gold’s keepsake map. Starting a family doesn't always mean "settling down" anymore. It's just the first adventure of many! Map the places you go together with this interactive keepsake. 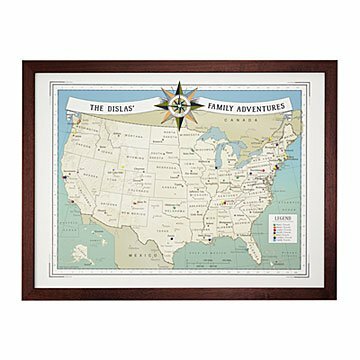 Personalized with your last name and the date your crew was established, Wendy Gold's vintage-inspired map of the US is framed and mounted on sturdy foam core. Printed with the words "Family Travels," it comes with a set of multi-colored push pins, so each person can pick a color that represents them. Use the pins to mark where parents met, vacation destinations, kids' college towns, and more as an artful and sentimental way to celebrate your journey together. Designed in California. Printed in Portland, Oregon. Check out our blog for more on Wendy's process and what inspires her. Arrives ready to hang with 100 multi-color pushpins, 10 of each color. Great gift. The map was beautifully framed and of high quality. My sister loved it and immediately hung it on her wall. The only downside was that there were not enough pins for her to track her group family travels - 10 of one color did not suffice. It would be great to be able to customize the amount of pins needed. This map is gorgeous and just as it looked on the website. Very Nice. It was exactly what we were looking for. Personalization came out great. Was wrapped very well to keep it intact during shipping.